The Commodores took a slight step back last weekend by dropping a series at Texas A&M. They left zero doubt this weekend with SEC East rival Florida in town. The Commodores cruised past the Gators in the first two games before once again unloading in the series finale, 14-4, to sweep the series from Kevin O’Sullivan’s club. For the weekend, the ‘Dores outscored the Gators 39-6. That’s called a beatdown. In Saturday’s contest, JJ Bleday hit an absolute bomb of a home run, while Stephen Scott and Philip Clarke also hit homers. Bleday finished the afternoon with two RBIs, Scott with four RBIs, and also a double, and Clarke with three RBIs. Furthermore, Austin Martin had a three-hit day and two RBIs, while Harrison Ray, too, had a strong showing at the plate with two hits — one a double and two RBIs. On the mound, freshman righthander Kumar Rocker continues to look the part. Rocker looked solid against A&M last week, and once again was good against the Gators, striking out six, walking two and allowing two runs and five hits in six innings. Meanwhile, righthander Tyler Brown closed out the contest with three innings of work. As for the Gators, it was a tough weekend for the starters, and righty Tyler Dyson capped it off by allowing eight runs on five hits in five innings. While Vandy answered some questions this weekend, the Gators head back to the drawing board. The Jackets haven’t been themselves for a couple of seasons, and they failed to make a statement on the road to being ACC play at Miami a few weeks ago. Well, they don’t have to worry about that anymore after taking a huge road series from top-five Louisville by pitching a shutout, 4-0, to take the series Saturday afternoon. Xzavion Curry tossed an absolute gem in the series opener, while in Game Two, it was all about talented lefthander Connor Thomas. Thomas struck out five, walked two and allowed five hits in the complete game performance. Meanwhile, Louisville lefty Nick Bennett allowed three runs on four hits in six innings. Offensively, it wasn’t a huge day for either team, but the Jackets did get a solid performance from Baron Radcliff, who hit a home run, walked twice and knocked in two runs, while Luke Waddell and hot-hitting Michael Guldberg each chipped in multi-hit performances. The Red Raiders took a step back last weekend with a road series loss to Texas but returned to normal this weekend by going 3-0 against Michigan, beating the Wolverines 8-5 in the series finale. Texas Tech All-American third baseman Josh Jung had a big day at the plate, smacking a two-run home run to lead the way, while Brian Klein and Gabe Holt each finished the afternoon with a pair of hits. Interestingly enough, Tech’s bullpen did the dirty work as the game progressed. 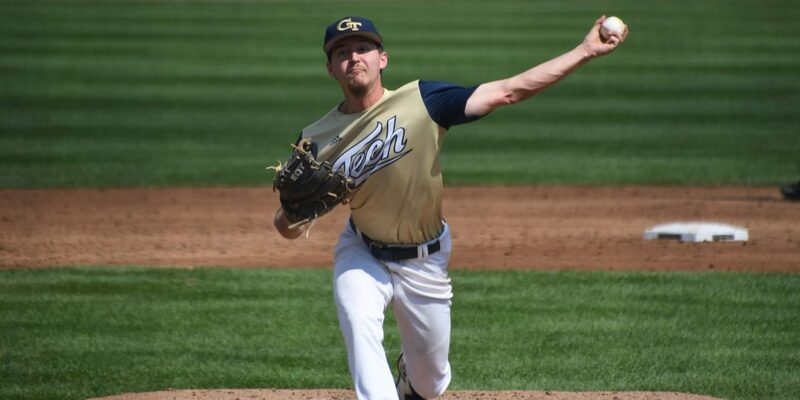 Tech lefthander Erikson Lanning struggled out of the gate, allowing four runs on five hits in 2.1 innings, while John McMillon tossed two innings, Dane Haveman struck out three in two shutout innings and hard-throwing righty Clayton Beeter finished off the game throwing 1.2 scoreless innings. It was a tough weekend as a whole for Michigan and its pitching staff. Wolverines starter Jeff Criswell allowed five runs and five hits in 4.2 innings, while also striking out and walking three. While the Red Raiders have yet another solid series win under their belt, the Wolverines end weekend non-conference play without a marquee weekend. They went 1-2 at the Dodgertown Classic a few weeks ago and went 0-3 this weekend against Tech. They’ll need to find a way to make that up in conference play. In our chat earlier this week, a user asked about the title race in the West Coast Conference. At the time, the league looked very much wide open. Well, it’s still open this weekend, but Pepperdine is at least giving us some clarity, improving to 4-1 in WCC play after beating Gonzaga 3-1 to clinch that series in Malibu. The win over the Bulldogs was the Waves’ sixth straight, and their pitching rose to the occasion in the series-clinching victory. Lefthander Easton Lucas gave the Waves yet another strong start this weekend, striking out six, walking one and allowing a run on five hits in a complete game performance. From a postseason resume standpoint, it’s still way too early to draw conclusions, but the Waves are an RPI darling through the first six weeks. Pepperdine sits at 13 in the RPI with a 12-7 overall record, thanks in part to five wins versus teams currently sitting in the RPI Top 50. Keep an eye on the Waves. They, along with WCC counterpart LMU, are one of the hottest teams in college baseball right now. The Wolfpack faced their toughest test to date so far this season this weekend down in Coral Gables. Miami was looking at the series as a potential statement maker, while the Pack was just hoping to continue their winning ways. Well, the Pack was victorious yet again, 7-6, on Saturday night to clinch the series win over the Hurricanes. Hard-hitting Evan Edwards set the tone for this one when he smacked a three-run home run in the fourth inning to give NC State a 3-1 lead. The Pack never looked back, as shortstop Will Wilson added some cushion in the top of the ninth with a solo home run to make it 7-2. It’s good Wilson hit that home run because Miami made a ferocious rally in the bottom of the ninth, only to fall just short. NC State starting pitcher Reid Johnston struck out six, didn’t walk anyone and allowed just two runs on six hits in 5.2 innings, while offensively, Tyler McDonough, Patrick Bailey and Wilson each finished the night with a pair of hits. For the ‘Canes, Michael Amditis and JP Gates each slugged home runs. NC State is 22-1 overall and riding high after yet another great series win. • Oregon’s Evan Williams hit a walk-off home run in the bottom of the 12th inning to give the Ducks a 5-4 win over Arizona State, handing the nation’s last unbeaten team its first loss (ASU is now 21-1). The two teams will play again on Sunday, and it’s a series the Ducks sorely need at this juncture. • Notre Dame dropped the first game of a doubleheader to Florida State, 7-1, but battled back in the nightcap, 12-3, to even the series at 1-1. Now, the two teams will do battle Sunday afternoon, and it’s an important one for both. Notre Dame looks to continue its ACC play surge, while FSU is coming off a series loss at NC State. • Georgia starting pitcher CJ Smith struck out seven, walked one and allowed two runs on two hits in 7.1 innings of work in a 2-0 win over LSU. That sets up a huge series finale in Athens. • Mississippi State’s Jordan Westburg went bonkers at the plate today, going 3-for-4 with a double and a home run and five RBIs in a dominant 15-2 win over Auburn to setup a huge series finale. By the way kudos to MSU fans for showing up in force as the announced attendance at The New Dude was 12,343. • Texas evened up its road series against TCU in emphatic fashion, beating the Horned Frogs 13-1 Saturday night. Talented freshman Eric Kennedy had a big night at the plate, going 4-for-5 with a triple and three RBIs, while Austin Todd added three RBIS and Zach Zubia hit a home run and knocked in four runs. • Oregon State dropped the series opener to California on Friday, but bounced back Saturday with a 3-2 victory. OSU righthander Bryce Fehmel put together an impressive performance, striking out three and allowing two runs on six hits in seven innings, while Jake Mulholland close it out with 1.2 shutout innings out of the pen. A huge finale in Corvallis awaits. • Alabama got roughed up by Arkansas in the series opener on Friday, but returned the favor in impressive fashion on Saturday with a 10-0 victory. Brock Love tossed five shutout innings, while offensively, Keith Holcombe hit a home run, double and knocked in a run. • Ole Miss dropped the series opener to Missouri on Friday, but bounced back in impressive fashion Saturday afternoon with freshman lefthander Doug Nikhazy leading the charge. Nikhazy struck out three, walked two and allowed two hits in seven shutout innings to setup a crucial series finale for the two teams. • North Carolina dropped the series opener to Virginia Tech on Friday, but bounced back on Saturday with a 7-5 victory. Michael Busch had a big afternoon offensively for the Tar Heels, going 3-for-4 with a pair of doubles and five RBIs. • South Carolina bounced back from a Friday night loss to Tennessee with a 3-2 triumph Saturday afternoon. Chris Cullen had a key two-run double in the game, while Brett Kerry was outstanding out of the pen with five strikeouts in two shutout frames. • Wake Forest’s Bobby Seymour roped a go-ahead single in the top of the eighth inning as the Demon Deacons beat Duke 9-8 to even the series at 1-1. Seymour finished the afternoon with a home run and four RBIs, while Patrick Frick also hit a home run, had four hits and knocked in two runs. • Houston’s Derrick Cherry smacked a fourth-inning three-run double to put the Cougars ahead for good, as Todd Whitting’s club answered Connecticut’s Friday victory with a 5-4 triumph on Saturday. The UH bullpen did a solid job with Nolan Bond tossing 2.1 shutout innings and righty Fred Villarreal tossing two shutout frames to close it out.